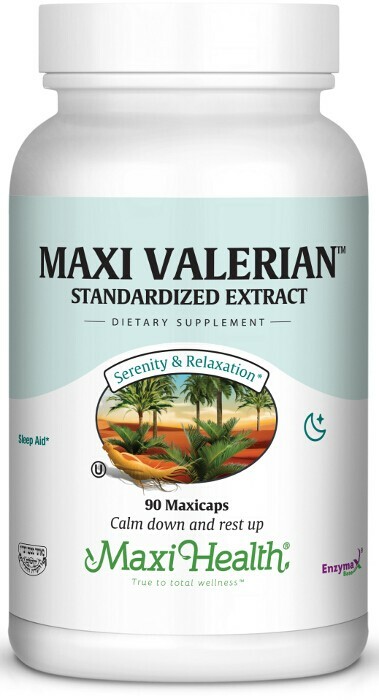 For those who are looking for valerian root to provide herbal support for stress, sleep, menstrual discomforts, and mood, Maxi Valerian™ offers you a 0.8% Valerenic Acid, standardized extract and an equal amount of valerian root powder. Valerian root is not addictive and does not cause grogginess. Make Maxi Health’s Maxi Valerian™ your choice today! Take one (1) Maxicap™ up to three times a day with meals, or as directed. Vegetable cellulose, microcrystalline cellulose, magnesium stearate, Enzymax® powder (calcium carbonate, bromelain, papain, lipase, amylase, protease, silica).